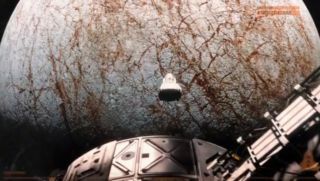 A screenshot from the teaser for "The Europa Report," a sci-fi film that depicts a team of astronauts exploring Jupiter's icy moon Europa for alien life. A team of astronauts heads to Jupiter's ice-covered moon Europa in search of alien life. If that sounds too good to be true, space geeks, that's because it is. The mission described above will take place onscreen, when the independent sci-fi film "Europa Report" hits theaters (likely sometime next year, though no release date has yet been announced). While "Europa Report" is fiction, it tries hard to get much of the science right, officials said. The filmmakers worked extensively with scientists at NASA and the agency's Jet Propulsion Laboratory in Pasadena, Calif., to give audiences an authentic vision of what a journey to Europa might look like, according to Wayfare Entertainment, which is producing "Europa Report." Astrobiologists are indeed mightily intrigued by Europa, which has a diameter of about 1,900 miles (3,200 kilometers). The moon appears to harbor a huge ocean of liquid water beneath its icy shell. Further, this ocean is likely in direct contact with Europa's rocky mantle, making a variety of complex chemical reactions possible. And tidal heating of the moon's interior provides an energy source that potential organisms could harness to power their metabolic processes, researchers say. Plans are afoot to get a better look at the enigmatic moon. The European Space Agency is developing a mission called JUICE (Jupiter Icy Moons Explorer), which would launch in 2022 to investigate Europa and its sister satellites Ganymede and Callisto. NASA, for its part, is looking into ways to study Europa from orbit or during multiple flybys. JUICE and NASA's concept missions to Europa are unmanned. A manned flight to the icy moon, as depicted in "Europa Report," is many years away. But that's what makes it science fiction. "Europa Report" stars, among others, Sharlto Copley ("District 9") and Michael Nyqvist (the Swedish versions of "The Girl with the Dragon Tattoo" and its sequels). The movie features music from Bear McCreary ("Battlestar Galactica").